Bartender Levi Alford pours a beer at Post Street Ale House. Craft beer is on fire right now, Matt Hall says, and that is one reason he thinks bars are upping the number of beers they have on tap. And he says it’s only the beginning. Hall, the craft import manager for beverage distributor Odom Corporation, says the trend took off in the past four years. Having a lot of taps means at least 16, but newer bars are starting to open with 20 or 30, and a couple even have 50. The lure of so many taps — and rotating a lot of them — is that it’s like having a menu that constantly changes, Hall says. When Waddell’s Neighborhood Pub & Grille opened in 2008, it started with 20 taps and progressed to the 50 it has now, says Waddell’s owner Michael Noble. “As the craft brewery business exploded, we keep adding more,” he says. The huge increase of good beer in the area is a reason, too. “Spokane is starting to become known for having really good craft beer,” Noble says. Waddell’s focuses on locally produced Inland Northwest beers, with about 15 continuously on tap. All local draft beers are always a $3.50-per-pint special. The Davenport Hotel’s Post Street Ale House keeps more than two dozen taps, including one of the more comprehensive selections of IPAs in the region. The front line of eight taps at Blue Spark is dedicated to Spokane-area beer such as Paradise Creek in Pullman and Iron Goat. The back line consists of Northwest brews from Oregon, Washington, Idaho and Montana, and one import: Guinness. “There’s so much tasty beer in the Northwest, we just need a lot of beer to satisfy palates,” says bar manager Avont Grant. When Manito Tap House opened in September 2011, it started out with the 50 taps it still has, including hard-to-find brews and seasonal offerings. 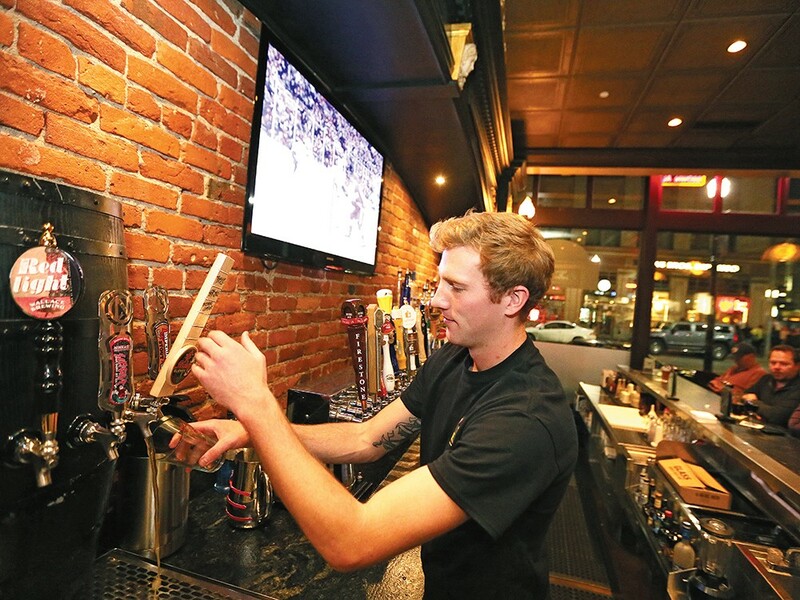 The slogan of this sports-clad pub is “More taps than tables.” At all three of their locations — Coeur d’Alene, Post Falls and the newly opened one in Hayden — they have just that. With seven standing taps and the rest rotating, Viking has a local selection of Washington and Idaho brews along with many tried-and-true favorites.